Welcome to the official discussion thread for Alien Soldier on the Genesis! To start, please add this game to your log, add it to your collection (if applicable), and (when you are ready) rate it using the link above! According to our database, not a lot of people have played this game (only Gojira has rated it! Shinriley is also a proud owner). Surely there would be some interest in a classic Sega Genesis game made by Treasure (especially one that wasn't released in the U.S. in the first place)? 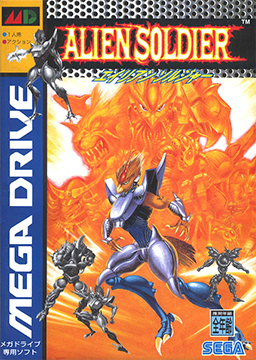 Even though it's not Gunstar Heroes, which sadly I haven't played in its original form (though I love the GBA remake), Alien Soldier is pretty cool in its own way. I was very fortunate to receive the prestigious Zero's Choice Award in the 2012 Review-a-thon, and I was gifted this Wii VC Genesis classic as my prize! I'm happy to be playing this game, but alas, I am awful at it. The game is a sidescroller shooter, run-n-gun, like Gunstar Heroes, but the levels are very short and basically you fight one boss after another in rapid succession. Considering your health bar is many times smaller than theirs, you're in for a very good challenge. So I'm playing on the Supereasy difficulty (the only other option is Superhard!) and it's still pretty hard. The game has an interesting mechanic where you can absorb enemy bullets to replenish health, but I'm bad with timing it appropriately while also trying to play offensively. I'm also not great at picking the right weapons before heading off in action. Anway, I'm now stuck on the Stage 9 boss (the guy who then transforms into a large beast and has massive claws); I haven't been able to figure it out! Why did I think this was a top-down game? Am I thinking of something else with ALMOST the same name? And this game looks oodles better than O-VER-RA-TED (clap clap clapclapclap) Gunstar Heroes. I wholly regret that purchase. I own the game but I haven't started it yet. Anything Treasure makes is at least worth checking out. There was this Treasure fansite I used to go to awhile back. The person who ran it spoke very highly of this game so I was excited when it came to the VC. Maybe I haven't given it enough time, but I wasn't that impressed. I've been giving the game more time, and it does have its moments and cool gameplay features, but ultimately it's too getting too frustrating for me to enjoy. I did get past the Stage 9 boss finally; I made it through a few more stages and am now stuck on the boss of Stage 12. Watching that youtube video, I don't see myself having the ability to pull of those kinds of moves. It's hard to avoid his attacks because the boat you're fighting on is so small, and it's quite unstable if you're trying to jump over his claw swings. Plus, you have so little breathing room between each swing! The clunky weapon switching in this game is such a big hindrance to an otherwise solid control scheme. You rarely have a break in the action to go straight to the weapon you want to select. I understand Treasure not wanting to make the weapon switch pause the action on the screen so that it adds to the tension, but considering how quickly your weapons run out of juice before they need 'recharging' means you'll be switching very often, and it seems they could have done a better job of implementing that. It's tough when you're trying to select your weapon set from the 8 offered to you. You take 4 with you, die, then mix it up a bit to see if something works better, and try again. Then when you finally complete another stage, you're likely to die again, then you have to experiment with your weapons sets all over again. It can be tiring. I've been meaning to pick it up as well Game Freak's Genesis title Pulseman. They both look like lots of fun.